Please refer to our stock # TR1004 when inquiring. 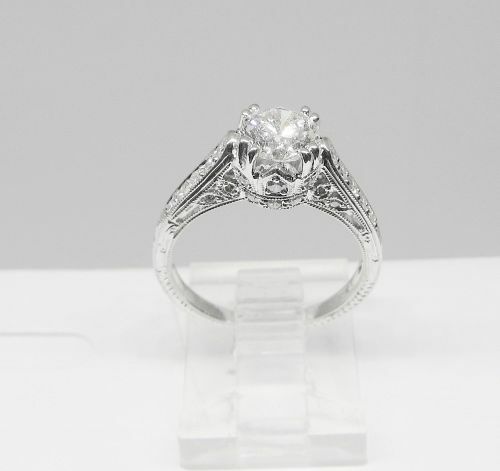 A masterfully crafted 18Kt white gold and diamond engagement ring in the Edwardian style. The ring is centered by a 0.96Ct GIA certified brilliant cut diamond that has H color and VS2 clarity. The setting is beautifully decorated by openwork, scroll and bead design and further enhanced by 30 smaller brilliant cut diamonds. The total weight of all diamonds is 1.33Ct. The ring is a size 6 ½ and can easily be sized.